Group western horseback riding lessons are designed for beginning riders to riders looking to further expand their skills. The program is a 1-hour lesson with a max of 6 riders per group. Participants register for a day: Saturday or Sunday. Participants will be contacted once registered and given an opportunity to give their time preference and horse knowledge/experience. However, lessons are grouped according to their skill level to ensure a consistent riding experience. Once all information is collected they will be assigned a specific group time slot. We offer comprehensive lessons in western riding. 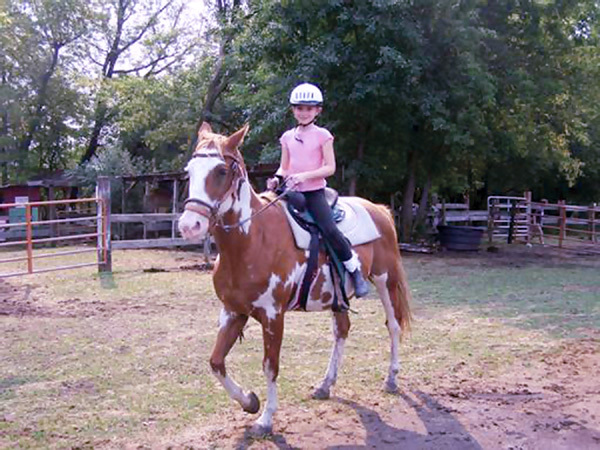 Learn riding skills in a fun, relaxed, and supportive atmosphere. Lessons go beyond just riding. Some components of what you may learn are how to catch your horse, lead, groom, tack up, ride, and care for your horse. Our instructors and assistants will guide you through the process, emphasizing safe horse handling practices both on the ground and in the saddle. Please email Christine Hanson with any questions.